When my friend and fish supplier, John at DelishFish told me his colleagues at the Amity Fish Company had just won an award for their trio of smoked fish in the Grampian Food Forum Awards, I wasn’t particularly suprised. Though I’d actually only tried one of the three fish that made up the trio, the smoked haddock that is supplied to me from DelishFish is so different to anything I can buy locally that I now hesitate to use anything else. More recently, John has sent me smoked cod to try and I used some to make a wonderful Norwegian inspired dish of smoked cod with fried potatoes, cream, dill and peas. 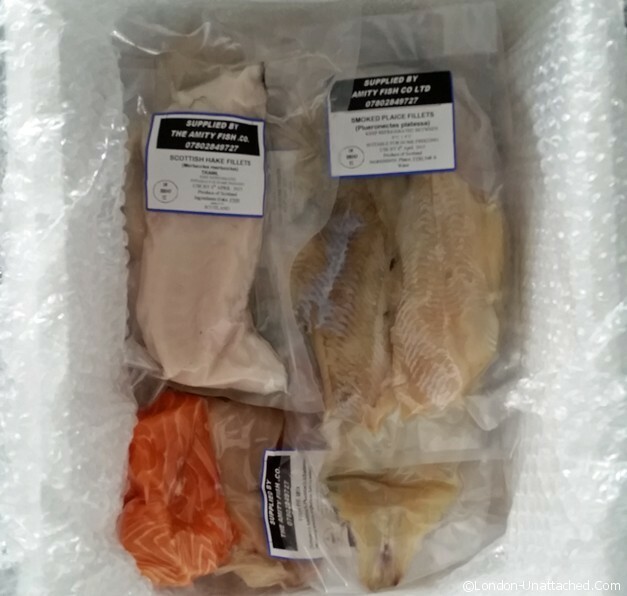 The latest batch of fish has included some of each of the smoked fish trio and I was keen to experiment a bit with the smoked plaice fillets. I love fresh plaice cooked simply on the bone, pan fried in a little beurre noisette and served with lemon. Filleted, plaice can be quite tricky to handle. It’s a very delicate textured fish that can easily overcook and disintegrate into a watery mush. From the outset, this smoked plaice appeared to have a much firmer texture. Despite my best endeavours to find a recipe on google, I really couldn’t find anything. 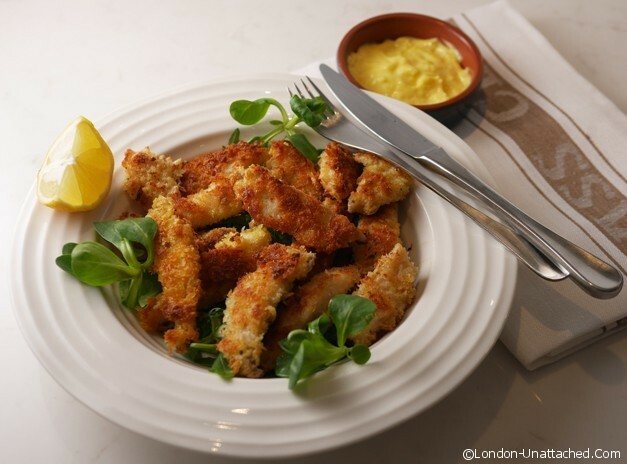 But, I have used plaice fillets to make goujons before and I had an inkling that the firmer texture and subtle smokiness would make an everyday dish quite spectacular. I wasn’t disappointed. Coat the fish pieces, first in flour, then egg. Dip each piece in the breadcrumb mixture pressing down gently. If you prefer, for a low calorie option, the fish can be cooked in a pre-heated oven at 180C. Place the pieces on a sheet of baking paper and bake for 10 minutes. Turn once half way through cooking. While this is quite a simple dish to cook, it is the perfect way to showcase a rather special product. I’ve already made this twice for myself for supper and am intending to serve it as a starter to friends on Easter Sunday. Sometimes it’s best not to mess around too much. If you are not keen on garlic this would work well with a tartare sauce too – but I love the way that the fresh garlic cuts through the smokey fish flavours. These look good, I absolutely love fish, all kinds! I’ve not tried smoked plaice but it sounds good & your finished dish looks delicious! This looks delicious, will be trying it at some point!